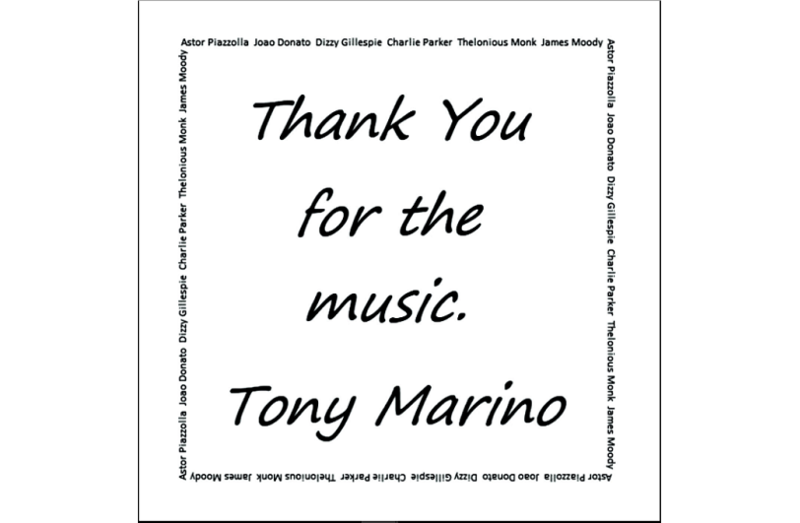 Exploring this project from Tony Marino is every bit as colorful and unpredictable as one might hope for when it comes to original Latin Jazz. The collection brings together seven original compositions, dedicated to Astor Piazzolla, Joao Donato, Dizzy Gillespie, Charlie Parker, Thelonious Monk, & James Moody. Beginning with Astor’s Prologue, the instrumental journey surrounds you in a partly calming ambiance and a partly manic, creatively free one. The riffs meander of their own free will, the structure lets certain moments of stillness refocus your attention, and all in all, the essence or original fire of the genre is gorgeously and authentically reignited. Mr. Donato paints a much brighter soundscape. The music feels at times like a leisurely stroll through the park, at other times like riding on a runaway train. There are a few signature moments on this one that really stay with you, acting almost like a hook – providing that familiar return every now and then. The rhythm of the song is superb, infectious and uplifting. This experimental, unstoppable arrangement of notes brings about the most positive of emotions – it feels like sadness would be an impossible thing to feel. The multiple instrumental layers also brighten things up and create a warmth or sense of togetherness. The musicianship is flawless, skillful and captivating. A live show would likely be an absolute joy to witness. Charlie Parker is a piece led initially by a free-flowing double bass line and a hopeful sax. Again, the instrumentation varies throughout – when the piano kicks in things really start to come alive. As a dedication to the best, the music works hard to meet the bar that has been set so high, and by all accounts, it succeeds. The melancholy bass-line introducing Dizzy’s Moods showcases an intense level of character, and this sentiment continues to grow. Even the minor moments that feature the bending of a note work well in adding these little details that help paint such a complex and energetic picture. Following this, a touch of high energy and rhythm come through for Monk Island. Marino’s creativity needs no helping hand, his desire to craft musical experiences far outweighs a simple ability to perform. Again, the instrumentation here is unexpected, free from the prison of genre or industry labels – just the sort of thing this type of music was intended to represent. Moody has a slight swing feel to it, dancing in a smoky bar, or sitting calmly as the world manically passes you by. The story told by the melodies is unique and seems to open your mind as you listen. The same can’t always be said about more structurally predictable genres. Things come to a close with Astor’s Epilogue. Some familiar riffs return, the ascending melody in particular, the haunting contrast between the two notes continuously repeated and these, much smoother, forever rising ones – it presents a fairly intense mood, reminding you of the humanity behind the work, the people who created and inspired more creativity, the journeys they experienced. Thank You For The Music as an album makes for the perfect way to say exactly that. Historical context, an awareness of where it all came from, and a personal desire to develop skills and perform in such a way, has all helped bring this project to life. Find & follow Tony Marino on Facebook. Visit his Website for more information.